Our day care programs are divided into 4 different age groups and designed to ensure the growth and development of each child. 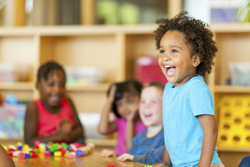 When your child enters our Infant program they will be provided with many art and sensory experiences, dramatic play themes, science exploration, music and movement and gross motor activities. 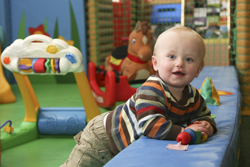 We accommodate each infant’s schedule while still having them be a part of the group. to provide a language-rich environment that encourages communication through positive interactions. 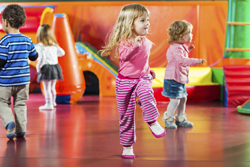 When your child enters our Toddler program they will be provided with many art and sensory experiences, dramatic play themes, science exploration, music and movement block building and construction and gross motor activities. They will begin have a more structured day and follow the Toddler daily schedule. In this age group we begin Yoga, and Dance as extra-curricular activities. Self-help skills are strongly encouraged and are coupled with teaching the children vocabulary to express their feelings and wishes. 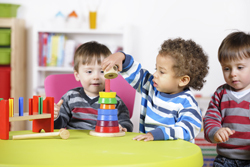 When your child enters our Preschool program they will be provided with many art and sensory experiences, dramatic play themes, science exploration, music and movement block building and construction and gross motor activities. They will have a more structured day and follow the Preschool daily schedule. In this age group they continue Yoga, and Dance and Science and mathematics activities are added as extra-curricular activities. Self-help skills are encouraged and being mastered. Toilet learning is emerging and encouraged and a routine is discussed with parents and mimicked at day care. We begin to teach the children how to problem solve and see other points of view with practicing empathy. When your child enters our Kindergarten/ School age program they will be provided with many art and sensory experiences, dramatic play themes, science exploration, music and movement block building and construction and gross motor activities. This program is geared to be an extension of their day where they have an opportunity to unwind from school and converse with friends. In this age group they continue Yoga, and Dance and Science and mathematic activities are added as extra-curricular activities. Kindergarten and School age children also have a direct say in the programing, scheduling rules and classroom responsibilities. During all school breaks they do cooking activities, have in house guest s and visitors and go on many community outings.